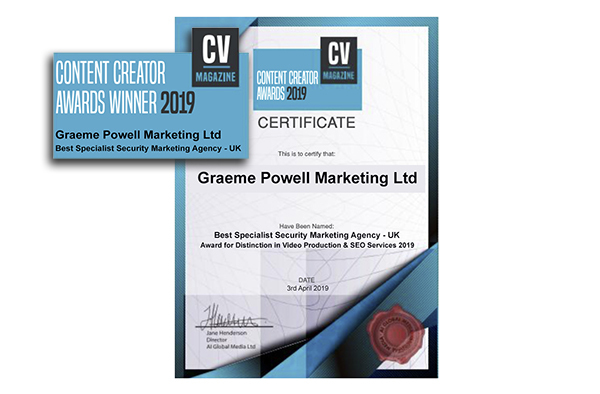 Graeme Powell Marketing (GPM), the security industry-focused PR & marketing specialist, has been awarded ‘Best Specialist Security Marketing Agency – UK’, at the Corporate Vision magazine 2019 Content Creator Awards. The Corporate Vision judging panel announced their final decision, awarding GPM ‘Distinction in Video Production & SEO Services’. Corporate Vision award winners are decided by a combination of votes gathered from respected industry partners and rigorous in-house research. Each award is carefully scrutinised, from a nominee’s region, to their performance over the past 12 months, looking at their commitment to innovation, methods and their respective competition – to ensure that only the most deserving firms walk away with a prestigious trophy.